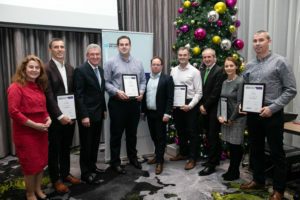 Over the course of last year, they have completed the Go Global 4 Growth course in conjunction with Enterprise Ireland and DCU. Sean, Mike, Mary, Alan and Paul spent 7 months up until December working hard to complete this course and help CET Connect with it’s commitment to adapting and evolving our business functions to prepare for global growth. A highly confident and professional top team; clear of their leadership strengths and challenges with a shared destiny, goal and direction. A shared company direction and value proposition which is clear and achievable. An effective leadership, management and board structure, to drive company growth. Realigned company structure, considering key roles, to support your strategy implementation. A shared strategic financial perspective which acknowledges the vital role of the top team in delivering sustainable and positive profitability, cash-flow and return on investment. Embedded measurement approaches; key performance indicators and individual SMART goals. Refined internal processes and controls which allow you to react to change. A HR/talent plan which supports the growth of your people. More open and consistent communications from senior team to ground level to support a culture of learning and trust. Implemented innovation tools and techniques to enhance your innovation potential and opportunities. Continuous awareness and the tools to assess the external environmental factors which impact market opportunities ensuring your company remains alert and agile. Developed and commenced implementation of a Go Global Road-map, aligned with Enterprise Ireland’s strategic objective to scale Irish companies. Established a network of trusted business peers whom you can leverage from in the long-term. To find out more about the Go Global 4 Growth initiative, follow the link below.